"Try to escape the well using your frog jumping powers"
Wellfrogy is a little platform game where you play as a frog who is stuck in a well, you must use your great ability to jump high heights to try to navigate the platforms and thin well ledges and try to make it to the top of the well and out in to the free world. The game has a fun 3D graphics style and the little frog hero character design is nice to look at, the game play can be a little bit frustrating at first as it can be quite awkward to power up your jumps, which you need to do by holding down the space-bar and releasing it when the power bar is full to give yourself the biggest jumps but trying to jump in the correct direction whilst doing this can be quite difficult at least until you get the hang of it. 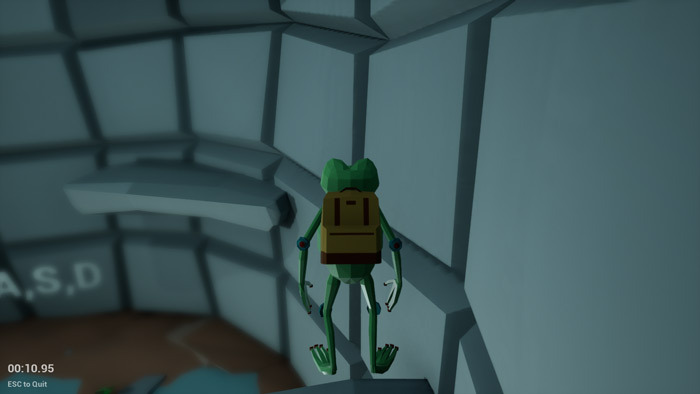 Once you have got used to the controls in Wellfrogy there is only one level and you may be disappointed with how quickly the game is all over, but you can go back and try to get yourself on the high score board by escaping the well in a record. 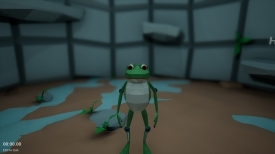 A simple and short but fun game, you can download Wellfrogy here for free.